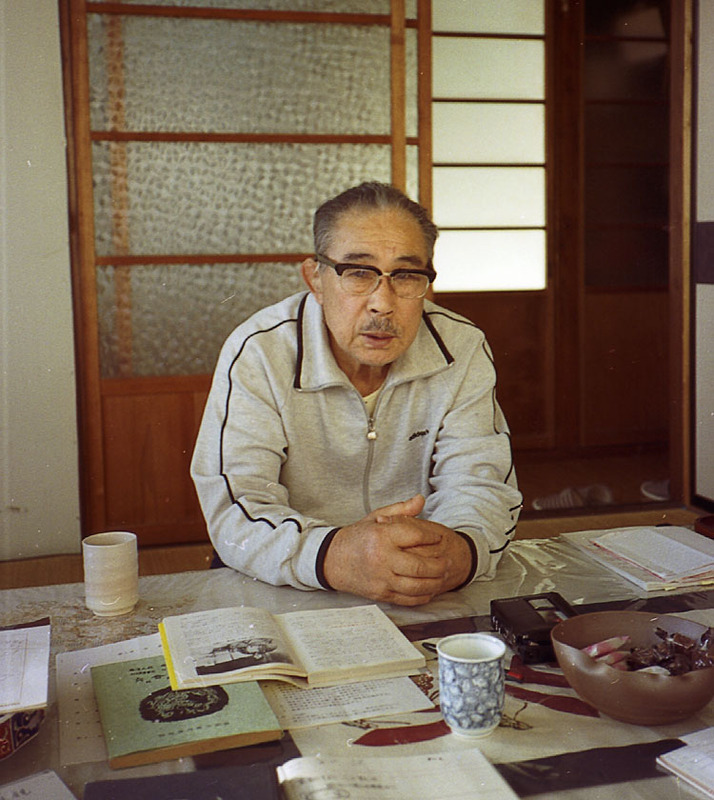 The following interview was conducted in the dojo of Minoru Mochizuki Sensei in Shizuoka City on November 22, 1982. 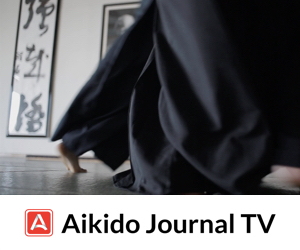 Aiki News: Mochizuki Sensei, the first martial art you studied was judo, I believe. Mochizuki Sensei: Yes, that’s right. I started the year before I entered elementary school. In the fifth grade we moved and I had to stop my training, though. Across the street and one house up from the new place there was a kendo dojo and so I started to do that instead. Then in middle school I took up judo again and I have been at it ever since. I felt that I would have liked to become a specialist in judo and so I went to the Kodokan (world judo headquarters). The year before that, though, I had entered the doo of one of the Kodokan teachers by the name of Tokusanbo. 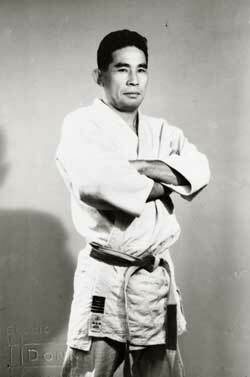 In those days in judo circles they said, “For technique, it’s Mifune but the devil of the Kodokan is Tokusanbo.” He was really a powerful and scary teacher. His dojo was located in a place called Komatsugawa. At that time I was living with my sister whose home was near there. I trained for about six months before we moved again and I entered the Kodokan to become a judoka. I entered Tokusanbo Sensei’s dojo in 1924. At that time, a teacher of an old-style jujutsu called Gyokushin-ryu lived very near to my sister. His name was Sanjuro Oshima. 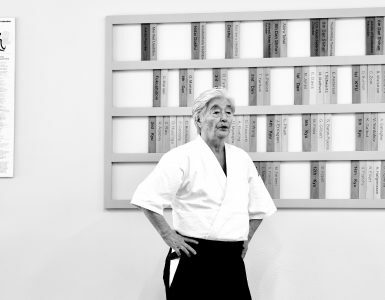 This teacher was really saddened to see the classical styles of jujutsu disappearing one by one and he was determined to see to it that his own art was preserved. So much so that he requested that I learn it from him. I would go to his house and would be treated to a fine meal. I didn’t have to pay any fees to study and they actually gave me dinner. That was how I cam to study jujutsu. Were you awarded some kind of ranking in this art? After about six months I received a license called the Shoden Kirishi Mokuroku which would be roughly equal to a first degree black belt in judo. That was the end of my relationship with that teacher, but to this day I still remember his words. “The name of our tradition is the Gyokushin Ryu. The name is written with characters meaning ‘sperical spirit.’ A ball will roll freely. No matter which side it is pushed from it will roll away. Just this sort of spirit is the true spirit that Gyokushin Ryu seeks to instill in its members. If you have done this, nothing in this world can upset you.” At that time I was still a child and so I didn’t understand what he meant very well. I simply imagined a heart or spirit rolling here and there. It wasn’t until I had passed 50 years of age that I can to understand what “Gyokushin spherical spirit” really meant. If you don’t spend 50 years at it, you won’t be able to get it. I had forgotten about it for many years. What other martial arts did you practice? I also did kendo. I’ve forgotten the name of my teacher but I don’t think I’ll ever forget the things he said. He once told me this. “When I was 13 years old I took part in the famous Battle of Ueno. Look at yourself! You’re 12, aren’t you? How do you expect to be able to pick up your sword next year being as weak as you are?” That’s the sort of teacher I had for kendo. So, during the time when I was studying judo with “Devil” Tokusanbo, I was also practicing Gyokushin-ryu jujutsu. 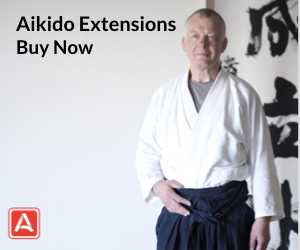 This system used a lot of sacrifice techniques and others that were very similar to those of aikido. Then, in 1926 I joined the Kodokan in May and in June I was officially promoted to first degree black belt. This was because before that, whenever I’d go out in any competition I would beat the black belts who came up against me. I think I had been more than black belt material for a long time before I received the grading. That’s why I was promoted to second degree the very next January, only a half a year later. The year after that I was made a third degree black belt. I guess I must have been about as strong as most third degrees during the time I was ranked at the second level. After all, I had been doing judo since before I entered grade school. What was judo training at the Kodokan like? Anyway, I ended up walking and running the whole way, and by the time I made it to the Kodokan I was dripping with sweat. There was a small well there but the top was always frozen over. I would smash the ice and splash water over my body from head to toe and then run into the dojo to practice. Well, one day when I got to the well, my usual bucket was missing. Someone must have carried it off someplace. I didn’t have a lot of time to spend looking for it or I would have been late for the start of class so I just jumped right into the well for a few seconds. When I went to pull myself back up out of the hole, I felt someone pulling me up by the hand. I turned around to thank him for helping me and who do you suppose it was? Mifune Sensei of all people! What kind of relationship did you have with Mifune Sensei? During the day Sensei would often tell us stories about various martial arts. That was especially good for me. I really learned just what judo was all about. It was often said since the old days that there was no way that a student who came to the dojo only to study and then returned home could get a license. In other words, such a person could never receive a menkyo kaiden master-level teaching certification. These outside students come for practice time and when training is over they return home. On the other hand, the uchideshi are there for 24 hours a day and so are able to hear all the various stories that the teacher has. I really learned a lot. You come to understand the spiritual idea behind the art. This story is about Jigoro Kano Sensei. Among his close students there was an excellent man by the name of Okabe who was really intelligent as well as being a strong judo man. However, this Mr. Okabe insisted that judo was a sport. “If judo is not a sport it’s nothing!”, he said. Now Kano Sensei truly loved this student but Sensei himself felt deeply that judo must not be turned into a sport. As you know in foreign countries there are churches which specialize in teaching people how to lead a moral life. In Japan, we have no such institution whose job it is to instill such a sense of morality and, as a result, Kano Sensei invented judo as a form of physical training which incorporated a method of moral training. While he was doing this it was a period when students had to really cram at their studies and, consequently, many of them would become sick. A large number died from lung diseases. Kano Sensei reformed the old jujutsu forms into judo; that is, he tranformed these techniques into a sport so that it became possible to do something of a sporting nature in the rather special atmosphere that we find in a dojo. We have make a distinction between seniors and juniors and things like that. 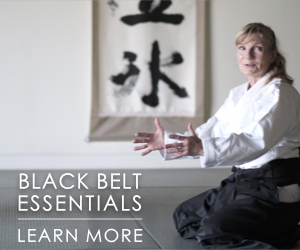 The do of the word budo (martial way) carries the meaning of “virtue” or “morality.” That is what a dojo is all about. 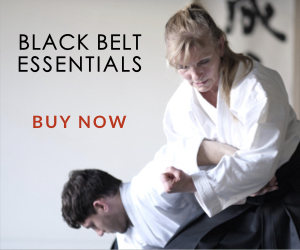 It is a place where you cultivate virtue while you train in martial techniques. It is essentially concerned with virtue. That’s why this one student and Kano Sensei had such heated arguments. No matter how much Sensei would explain his viewpoint the other man would insist that “such a half-hearted art is unacceptable. The method of winning and losing in judo is a sport and personality development is personality development. There is no need for any form of moral cultivation in sports. It comes naturally while you play.” Later this man received certification as a master of physical education. He was extremely theoretical. All of this made Kano Sensei think. If a person does only judo it seemed that their art turned into pure sport. For this reason he decided to introduce training in classical martial arts into the Kodokan and had a special dojo built for that purpose. He had hoped to show the pre-modern martial arts to everyone there and those who were interested would be able to freely practice. He thought that if he could get them to come to understand the spirit of the classical martial arts they would then be able to practice developing the true budo spirit. 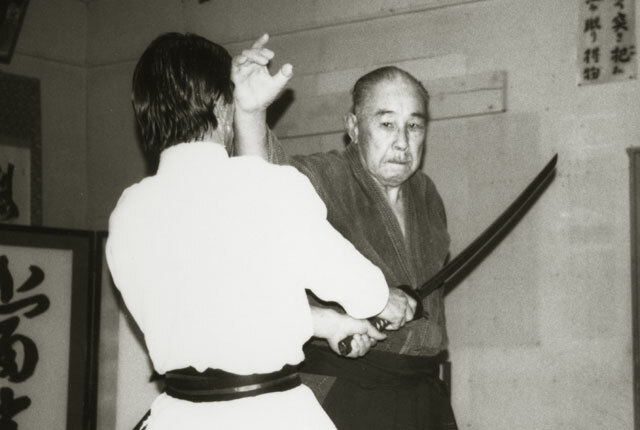 That’s how he came to establish the Kobudo Kenkyukai (Association for Classical Martial Arts Research). Were you connected with this group too? At the time I was only a boy of 21 and so I listened with the feeling that I understood somewhat what he was saying and yet I didn’t understand. Since “ju” is something that is very rational, it is quite an intellectual concept. Would you tell us about association with Kano Sensei? On one occasion I took part in a judo tournament at Nihon University. I went out and won. Then, that same afternoon, there was another competition at Meiji University which I also won. There I was with two medals in one day. I was still a kid then and really happy about it so I completely forgot about my appointment with Kano Sensei for that day and rushed straight home. When I got there my sister asked me if I hadn’t promised to got to Sensei’s home. I rushed out of the house and jumped on a train back to town before I realized I’d forgotten my wallet. With lowered head I was able to get the conductor to let me get by that time, but the problem was that I had to change trains along the way. When I had no idea that I didn’t have my money it was not a problem to just jump on the train as usual. Now, however, I knew before hand that I couldn’t pay so it was really hard to get up the nerve to get on. (Laughter) I hesitated and finally I just explained the whole story to the new conductor and he kindly agreed to let me on. I’ll never forget that terrible feeling. Anyhow, I rushed to Sensei’s place like that and arrived for my 2 pm appointment at about 4:30. Sensei was a very busy man. He was the type who planned his workday second by second and so I was worried about how badly I’d get bawled out this time. It was with these thoughts that I went to meet him. Kano Sensei was 70 years old at that time and when he heard that I had finally arrived he slipped into a hakama to meet me. He actually changed to more formal attire just to meet a student some 50 years his junior. He stared at my face for a few seconds then asked if I was sick. Then I explained how I’d just come from winning the two medals. There must have been a hint of pride in my voice because Sensei’s tone changed completely. “Just what is it that you think these tournaments are anyway?” I had won and so I just could not figure out why he wasn’t happy about it. he continued, “We write the word shiai with characters which mean ‘to try out together.’ Shiai are part of the art in order for you to measure the limits of your own strength at any point in time. Does it take you two times in one day to do that!” I’d been out there just to win. I hadn’t given any thought to the trying out of my strength. Sensei then went on, “You have mistaken understanding of judo. Competition is not some sort of game you do for fun. With that kind of attitude you’ll never be a very good instructor.” Although there was a large age gap between Kano Sensei and myself, he had already started trying to educate me about how to become an instructor. Around the same time I was also training in Katori Shinto-ryu. This art includes the sword, staff (bo), naginata, spear, short sword, two swords together and jujutsu techniques. I was stil doing kendo too so I was going around to various dojos and training for five or six hours daily. I went to from four to five different dojos. Moreover, before breakfast I was learning something called Shindo Muso-ryu Jojutsu. I got strong very quickly. 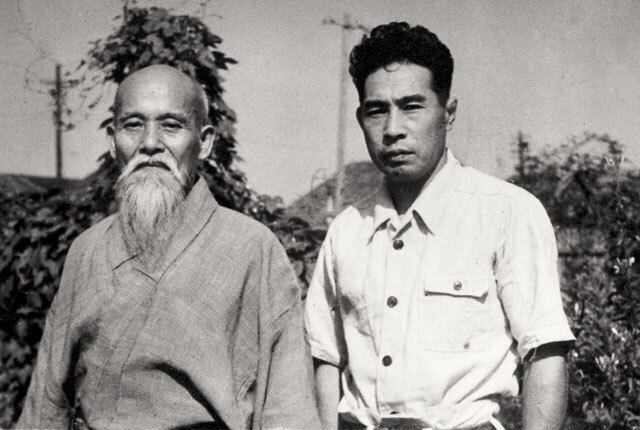 It was about this time the Kano Sensei went to a demonstration by Ueshiba Sensei at the invitation of Isamu Takeshita, a naval admiral. Kano Sensei was very impressed. He told Ueshiba Sensei that he would like to have him educate some of Kano’s own students if he sent them to the Ueshiba dojo. Thus it happened that I was sent there. At first, I only considered it one more thing added to my already busy training schedule. Kano Sensei told us, “The other day I had the chance to see for myself the techniques of a jujutsu teacher by the name of Ueshiba. It was really wonderful. I felt it was really the true technique of judo. I would like to have Ueshiba come here to teach at the Kodokan, but he is a famous master in his own right so it is impossible. That’s why I’ve arranged to send some of our own members there to train.” He signaled with his eyes that he would like me to go. so a fellow named Takeda and I ended up being the ones. With that I got his permission to do so. The only condition was that I continue to attend the classical martial arts research group classes as I had been doing before. So I immediately became one of Ueshiba Sensei’s assistants. And you know, I was never taught by Ueshiba Sensei directly with him telling me to do this or that. Whenever he did a new technique Sensei would correct all the others individually but he’d never correct me. I’d watch Sensei’s technique and just do it like him. Sensei said that I was the person he least needed to worry about. I would just watch and understand. The reason is that I had done a lot of other martial arts so I could do the techniques. One day Admiral Takeshita called me over. He wanted to inform me that Ueshiba Sensei was interested in having me become his adopted son-in-law (marrying his daughter and taking on the Ueshiba name). Now what was I to do? I had already been asked at the Katori Shinto-ryu to do the same thing and there was a president of a pharmaceutical company who lived behind my sister’s house who had traveled all the way to my home in Shizuoka Prefecture to ask my family to let me marry into his family. For the most part, I myself had little experience even talking to girls other than my own sisters and I had certainly never given any thought to getting married, so I ended up refusing all three offers. It was about that time that I became very sick. It was just plain overwork. I stayed away from practice for about a month and slept. Kano Sensei was really worried about me and went as far as calling a hospital then and there about having me admitted and was willing to let the Kodokan cover all of the expenses. But my brother from Shizuoka came up to take me back down there and so I expressed my deep thanks to Kano Sensei for his great kindness and left Tokyo. I was then admitted to the Shizuoka City Hospital and had to stay thre for three months. The doctors were surprised by the speed of my recovery. I was suffering from pleurisy and pulmonary tuberculosis but everyday the doctor said he could tell I was getter better rapidly. That same year my brother and some others had built a dojo in the center of town and I guess they were afraid that if I went back up to Tokyo I would die. Anyway, we decided that when I got out of the hospital I would start out slowly by teaching the young people in the town as I recuperated. When word of all this reached Ueshiba Sensei, he, Admiral Takeshita, General Miura, Shunnosuke Enomoto Sensei, Yasuhiro Konishi Sensei, and others all were kind enough to come down for the dojo opening ceremony. After that, every month, when Ueshiba Sensei went to teach at the dojo of the Omoto religion in Kyoto, he would stop in on his way there and on his way back. There were times when he would stay for two or even three days. He really liked me. Sensei would tend to stay on and not go home so sometimes his son, Kisshomaru, would have to come to get him. That’s how much he liked my place. It was about that time that he gave me the scrolls for the menkyo kaiden (master teacher’s license). One of them is about two meters long and the other about three meters in length. The longer one is entitled “The Self-defense of Daito-ryu Aiki Jujutsu” while the other has “The Innermost Teachings of Daito-ryu Aiki Jujutsu” written on it. I don’t think that there is any other person alive today who has ever received this kind of certificate from Sensei. Tomiki Sensei only received his scrolls a little before I did. Actually just a couple of days ago one of Tomiki Sensei’s students was here and we talked about a lot of things. Tomiki Sensei and my brother were both born on the same day in the same year and so they became extremely close friends. I personally was never so close to him. 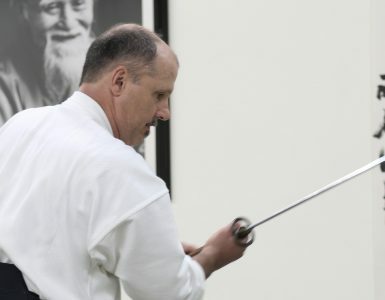 He had been doing aikido for about five years before I started and so was quite a bit my senior in the art. Then again, he was an academic eprson and I studied many things through his writings. But if I think that something is a mistake I am the type of person who will come right out and say it’s wrong. I often put things rather frankly even to Ueshiba Sensei. Then, after getting scolded for doing that I would rethink whatever matter it was at that time. “Sensei, you may talk about changing martial arts into sport but I have no intention of doing any such thing.” He countered, “But if we don’t convert them into sports, aikido will wither away and die.” My feeling on this subject are exactly the opposite. I think that the day that Japanese martial ways become sports will be the day the they die. Sports emphasize the fun of winning and losing and even physical education is only a secondary concern. They are totally devoid of character training. This sort of thing is not what martial arts are about. If the river of Japanese martial arts should ever flow into the ocean of sporting activities, it is sure to become polluted by salt water before it has flowed even 100 yards. 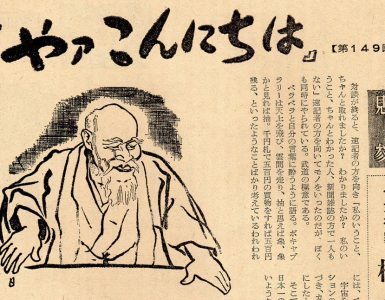 Both Kano Sensei and Ueshiba Sensei insisted that the education method for martial arts must never be turned into some sort of game. The famous historian, Arnold Toynbee once wrote something like this, “Civilization is something that is born in a particular country. But should it gradually grow and spread and become a world-wide phenomenon, it will at that time cease to exist in the country of its origin. Furthermore, it will never return to its birtplace. This is a fact of history.” Buddhism in India, Christianity in Israel, and Confuciansim in China are all good examples. This is something we should watch out for with respect to the martial arts. If aikido or judo ever become part of the world of sports, then they will certainly become distracted by the sort of games that involve winners and losers, the strong and the weak. Their value as spiritual education and character development will be lost. Martial arts will become extinct. It’s fine for Japanese martial arts to spread around the world, but it should never be taken over by the sporting spirit of a game. If the martial arts don’t put heavy emphasis on character development, then this will only be the cause of misconduct, especially in the case of young people. When I told Tomiki Sensei these things he couldn’t answer. He didn’t say anything. He acted like it wasn’t worth replying to someone as stubborn as me and that if the kids just go on doing whatever they are doing then everything will be fine. One of the causes of delinquency involves a young person dropping out of his group of friends on a sports team. Coaches, however, are only interested in training team members and in the question of winning and losing. They pay no attention to those who drop out because they are only interested in winning. In sports there is no place for the weaker or the less competent. Personally, I would rather see the transformation into martial arts of the various sports so that they become more concerned with spiritual development and the prevention of misconduct. They should be more concerned with developing young people who are no trouble to their parents, who get along well with their siblings, and with promoting good relations between husbands and wives. On the other hand, if we speak of harmony, we are talking about something which includes the notion of reason. Love is an emotion and cannot stand alone. It must be firmly bound to proper etiquette (reigi). Love must include correct behavior. The old saying, “Even between the best of friends proper etiquette prevails,” applies. Even between maried couples it is a necessity. It starts with “good morning” every day. Recently, proper etiquette has given way to simple emotions. Couples think that as long as things are fine with them if both of them are fine. That’s all that counts, but in the real world this is no way to behave. According to an old Japanese limerick, “If you look at the character for “person” very carefully, it consists of two mutually dependent strokes.“ Human beings are social animals. We can eat rice because farmers exsist. Without them, with would have to produce food for ourselves. In other words, we help each other. This concept of you and me only is incorrect. Harmony consists of emotion and reason. This is the nature of harmony. Martial arts teach eitquette and reason. The manner of directing one’s spirit is also learned through martial arts. In foreign countries, these values are taught in church. 30 years ago, I was in France for two-and-a-half years where I taught judo. One day we had special training sessions in preparation for a competition so I told the students to come to training on Sunday too. But they explained they were unable to come because they had to go to church. I was very surprised to hear this. I didn’t think that young people went to church. I asked them whether they got bored listening to the same storeis about God every time. They responded, “Sensei, human beings are forgetful animals.” “I see,” I thought to myself. I sometimes forgot about the teachings of my Sensei and the kami (gods) and quarreled with my wife and brothers. Forgetful… I really believed they were right. I was ashamed of myself and I found myself reflecting on my conduct. We have to listen to stories about the kami often because human beings are forgetful. Then, for the first time I understood why Kano Sensei expounded the importance of the “Way” while teaching judo and why Ueshiba Sensei often mentioned the kami while teaching aikido. I felt that this was the true meaning of martial arts. Wonderful interview. I can’t wait for the next instalment as I find martial arts biographies really interesting especially when they come from some time ago. What a wonderful interview! I’ve learned so much by reading this and look forward to the second part!